In September, Vicenza puts its best foot forward to honor both its patron saint, La Madonna di Monte Berico (Blessed Virgin Mary of Mount Berico), and its rich civic past. Most days and nights play host to social, religious and gastronomical events and activities that fill up the calendar of this jewel of a city in the Veneto region of northeastern Italy. 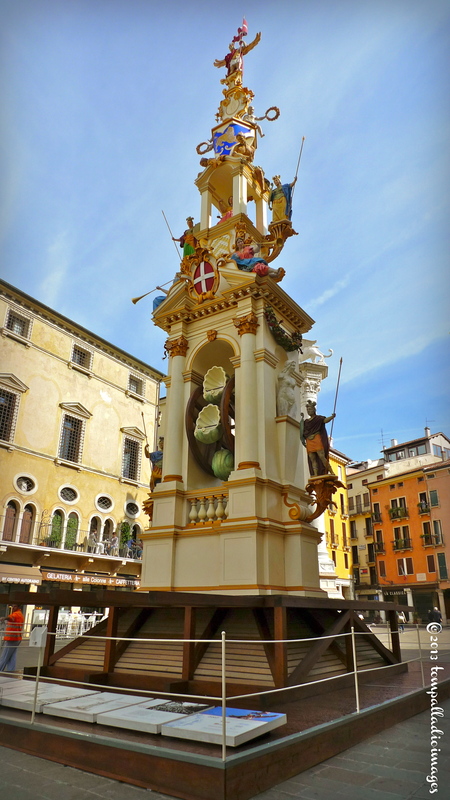 One of the highlights of this very long, tradition-filled, annual celebration is the unveiling of La Rua (The Wheel) in the Piazza dei Signori of the city’s Centro Storico (Historical Center). Dating all the way back to 1444, several decades after the Blessed Virgin Mary appeared twice in Vicenza to rid the city of the plague and be named its patron saint, La Rua is a wooden tower filled with colorful, life-like characters that are symbolic of the city’s past. In days of old, the completely wooden structure was paraded around the Centro Storico pulled by an army of volunteers with local VIPs — mainly rich notaries — riding high above in a rotating carousel waiving at the crowds below and, no doubt, holding on for dear life. That original version of La Rua made its last lap back in 1928 under the pouring rain. Weighing in at 20 metric tons and rising 24 meters from its base, today’s version of La Rua — based upon a 15th century design by Andrea Palladio — showcases a small Ferris wheel-like mechanism that rotates around. No longer pulled through the streets to cheering crowds, the impressive La Rua of the 21st century stands proudly in place throughout the month of September, on display for all to gaze up and wonder what it was like when the original wheel was unveiled for the very first time almost 600 years ago. Hi Tom, I enjoyed reading about La Rua. I am a vicentina residing in Hitchin, UK and miss my lovely town. Thank you for your contribution which brought back many fond and happy memories of childhood. Irma — Glad my article brought back fond memories of La Citta’ di Palladio. All the best. Many thanks, Penny. Glad you enjoyed the article and the pics.